While your kids may want to keep jumping as long as the rental lasts, how much exercise do they need on a daily basis? According to the CDC, children and adolescents should be getting at least 60 minutes of exercise a day. The exercise should involve cardiovascular activity for a healthy heart and lungs. While an hour may seem like a lot, if you include a vast array of creative activities, you can log this easily. The exercise routines of adults can be boring, but kids tend to be creative and entertaining, even when they’re getting exercise. If your kids are huffing and puffing when they exit the bounce house, don’t be surprised. According to NASA, 10 minutes of bouncing (or rebounding) is a more efficient cardiovascular workout than over 30 minutes of running. Not only does jumping get your heart rate up, but it also works a variety of muscles, which is crucial for proper development in children and adolescents. Jumping targets quadriceps, hamstrings, hip flexors, calves, and more. While the physical benefits are laudable, there are also a number of studies that link regular exercise to decreased depression and increased happiness. 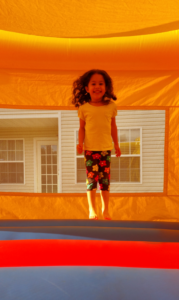 Not only do children find the act of jumping in a bounce house fun, but the exercise they get from it will only increase their happiness thanks to endorphins. By emphasizing fun ways of exercising, children are more likely to latch onto a healthy lifestyle and maintain a positive outlook on exercise. 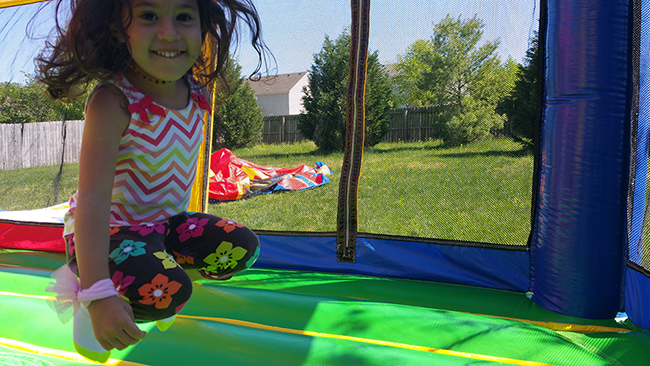 Since we all want our children to be happier and healthier, it’s time you get them jumping into a bounce house!